While working with the French wine industry in 1848, Dr. Louis Pasteur studied tartaric acid, a blackish purple substance that grows on the back of wine barrels. 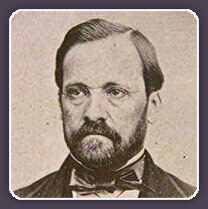 By studying this byproduct of wine fermentation that he called "wine diamonds," Pasteur concluded that molecules associated with life are structured exclusively with a left-handed design. Today, we know that left-handed amino acids are the building blocks of life. Nearly all living organisms on Earth, from bacteria to humans, make proteins from left-handed amino acids.